We’d love your help. Let us know what’s wrong with this preview of In the Valley, Where Belladonna Grows by Tim Lebbon. Today is the day the world changes … or ends. Mary exists alone in a valley, happy, surviving, but all too aware that the terrible dangers beyond her home must one day come home to roost. And that day is now. An apocalyptic vision from one woman’s damaged mind, this story is for anyone who has ever felt alone. A dark nightmare of solitude and rejection, pride and guilt, Today is the day the world changes … or ends. In The Valley, Where Belladonna Grows is a gripping dystopian novella that blends prescient elements of science fiction with spine-chilling horror. TIM LEBBON is a New York Times-bestselling writer from South Wales. He’s had over thirty novels published to date, as well as hundreds of novellas and short stories. His latest novel is the thriller The Hunt, and other recent releases include The Silence and Alien: Out of the Shadows. He has won four British Fantasy Awards, a Bram Stoker Award, and a Scribe Award, and has been a finalist for World Fantasy, International Horror Guild and Shirley Jackson Awards. Future books include The Rage War (an Alien/Predator trilogy), and the Relics trilogy from Titan. To ask other readers questions about In the Valley, Where Belladonna Grows, please sign up. I'm not sure how to review this one, other than to say it's very good, that it would make an outstanding book for discussion in a book club or high school English class, and that Tim Lebbon has quickly become one of my favorite writers. In the Valley, Where Belladonna Grows is about as perfunctory and pedestrian a story as you will ever read from a usually very talented writer. Here Tim Lebbon substitutes his usual horror-laden musings for something more philosophical that has a fantasy air about it, but which largely falls flat in pacing and execution, before culminating in a resolution which goes beyond cliched. The bonus tale, THE GOD OF RAIN, fares little better, even if both stories are technically well-written from a sente In the Valley, Where Belladonna Grows is about as perfunctory and pedestrian a story as you will ever read from a usually very talented writer. Here Tim Lebbon substitutes his usual horror-laden musings for something more philosophical that has a fantasy air about it, but which largely falls flat in pacing and execution, before culminating in a resolution which goes beyond cliched. The bonus tale, THE GOD OF RAIN, fares little better, even if both stories are technically well-written from a sentence to sentence construction standpoint. I think it is a good thing that I didn't read the synopsis very closely before starting this one. The first sentence kind of gives everything away. The writing was lovely, descriptive and metaphorical all at the same time. The dreamlike flow to the story was also enjoyable once I gave myself to it. I fought too hard with my what/why/how's in the beginning and I missed out on a good portion of the story. I don't want to say much about the over all theme, I think it would give too much away. I will b I think it is a good thing that I didn't read the synopsis very closely before starting this one. The first sentence kind of gives everything away. I will be looking for more by Lebbon. The formatting on the edition I was given through Netgalley took a way from the experience as well. Hopefully the finished version is a bit cleaner. I've only read a few of Tim Lebbon's writings, but this is my favorite by him so far. For years, a woman has dwelt alone in a valley, a self-sufficient homesteader. Originally, her situation was exile. She was cast off, banished by her lover, who, we gather, was a man of power in a post-apocalyptic city. But eventually, she has come to realize that on her own, she has more freedom than she ever did with him and his abuses. However, now, visitors have begun to arrive to disturb her solitude. And n I've only read a few of Tim Lebbon's writings, but this is my favorite by him so far. However, now, visitors have begun to arrive to disturb her solitude. And now, everything may change. I loved everything about this story up until the "twist" ending, which brought my overall opinion down a bit.. for me, it just didn't quite fit. Many thanks to Endeavour Press and NetGalley for the opportunity to read this short. As always, my opinions are solely my own. This review has been hidden because it contains spoilers. To view it, click here. This was a great read right up to the relevation that she was in a coma, a bit like when you find the narrator is a dog. Such a shame, as the character was strong, had me going, the plot was good' until the end. The structure and scene development was fantastic, I could see and feel the cottage, garden, and fields, and all that came with it. In the valley where the beladonna grows lives an aging woman. She lives by herself, her only companions the domestic animals she raises and the birds and small mammals who share her valley. Her vibrant, verdant garden is fenced in, primarily to keep the belladonna plants from encroaching. The woman is named Mary, and for sixteen years she has lived a life of exile from other people and of incredible peace and satisfaction. The morning she sees a man walking down a deserted path toward her garden, In the valley where the beladonna grows lives an aging woman. She lives by herself, her only companions the domestic animals she raises and the birds and small mammals who share her valley. Her vibrant, verdant garden is fenced in, primarily to keep the belladonna plants from encroaching. The woman is named Mary, and for sixteen years she has lived a life of exile from other people and of incredible peace and satisfaction. The morning she sees a man walking down a deserted path toward her garden, everything begins to change. This novella seems almost like a fable: Mary receives five visitors over the following weeks, each increasingly alarming. She begins to lose her feeling of security and wants/ fears the news of the changes that have been occurring in her absence. Must she set out on a quest to learn the answers to questions her visitors have put into her mind? What will she find at the end of her journey? The story, for the most part, is engaging, as a fable must be. There are monstrous canids that become harder and harder for Mary to fight off. There is a terrible storm, which may or may not be what brought them into Mary's valley. Her visitors seem more and more desperate. I was expecting a big, enlightening climax. Unfortunately, the end was sudden and strained, as if tacked on as an afterthought. I wish the author had continued the story as lyrically as the first 2/3s. I felt cheated by the combination Twilight Zone and Hallmark card ending. A writer as talented as this one should be able to carry it off. Thanks to NetGalley and Venture Press for providing an ARC in exchange for my review. This book was so different from what I expected - I was completely and cleverly misguided by the words apocalyptic and dystopian used in the book's description. Naively expecting another end-of-the-world scenario, I was absolutely not prepared for what I got. Throughout the whole book I was repeatedly thinking "what is going on here?" and still had not clue whatsoever. Only at the end the unexpected truth is revealed and I was blown away. Never would I have guessed the outcome, and I was stunned This book was so different from what I expected - I was completely and cleverly misguided by the words apocalyptic and dystopian used in the book's description. Naively expecting another end-of-the-world scenario, I was absolutely not prepared for what I got. Throughout the whole book I was repeatedly thinking "what is going on here?" and still had not clue whatsoever. Only at the end the unexpected truth is revealed and I was blown away. Never would I have guessed the outcome, and I was stunned at the elegance and simplicity of it. Suddenly, everything fell into place and made perfect sense, however sad and devastating it may be. Expertly written in a quiet but haunting prose, this story still reverberates in my mind, obviously taking up permanent residence in some dark corner. Lurking in the shadows, it makes some silent appearance now and then, bringing with it a sad and spooky vision of a hopefully unlikely, but still possible fate. After discovering Lebbon's talent last year I was really looking forward to reading this novella which was supposedly something of a hidden gem. Having read it now though, I don't have much to say about it: Nice story with some interesting elements and the usual grand writing but "In the Valley..." left me rather cold and untouched in the end. For me, it was still a bit underdeveloped, for once I am thinking a piece of writing could have been longer (and I love me some good novellas). I was more After discovering Lebbon's talent last year I was really looking forward to reading this novella which was supposedly something of a hidden gem. Having read it now though, I don't have much to say about it: Nice story with some interesting elements and the usual grand writing but "In the Valley..." left me rather cold and untouched in the end. For me, it was still a bit underdeveloped, for once I am thinking a piece of writing could have been longer (and I love me some good novellas). I was more impressed with the second piece, "The Rain God", a great short story about dealing with loss including some subtle, creepy ideas. I'm a very big fan of Tim Lebbon and I'm slowly working my way through all his books. This one was slightly different than the rest as he attacks everything from a different angle, however I all thoroughly enjoyed it. The story revolves around a 70 year old woman stuck in a valley where she must fend for herself and protect herself from the , however the influx of visits and messed up dogs changes everything. A nice read with a twist at the end, although it's quite easy to see the twist Good read! A novella/short story (my copy was 65 pages) about an old woman who lives alone, entirely self-sufficient, in an isolated valley. She hasn't even seen another human being in 16 years – at least until the opening pages, when a man appears on the road from the distant city, bringing news and unwelcome changes. The writing is lovely and subtly creepy, with an increasing sense of wrongness conveyed through small natural details: a too-strong storm, a dead bird, a feral dog gone mad. The backstory is A novella/short story (my copy was 65 pages) about an old woman who lives alone, entirely self-sufficient, in an isolated valley. She hasn't even seen another human being in 16 years – at least until the opening pages, when a man appears on the road from the distant city, bringing news and unwelcome changes. The writing is lovely and subtly creepy, with an increasing sense of wrongness conveyed through small natural details: a too-strong storm, a dead bird, a feral dog gone mad. The backstory is told through scattered flashbacks, filling in how the woman originally came to live in the valley, while her knowledge of all that has gone wrong in the world outside slowly increases through the hints dropped by her visitors. There's a slight sense of unreality in how thoroughly the woman is tied to her home, and how she can sense disorder within her valley just by closing her eyes. All of this is pretty great, and I was enjoying it and looking forward to seeing how the various plot threads would be resolved – and then came the twist ending. Granted, it's not the worst execution of this particular twist I've ever seen (it's a common ending), but it's so much less interesting than everything that came before it that I couldn't help but be disappointed. Overall, this was 62 pages of a wonderful story and 3 of a mediocre one. Mary has been on her own for 16 years, ever since Sherlock, had banished her. Things aren't as they seem when Mary comes to the realization that the Valley she has lived in for 16 years may not be the freedom she thinks it is. What did I just read? This was trippy and strange with a disappointing and unsatisfactory ending. The writing was lovely though. Reviewed by Lee Ashford for Readers' Favorite. “In the Valley, Where Belladonna Grows” by Tim Lebbon is a wonderful story of a woman exiled from the city in which she had lived with her husband, now dwelling in a virtual paradise of untainted nature. Mary had been sent away by Sherlock, her husband, because she dared to strike him back while he was beating her. She was forbidden from ever leaving the valley to which she had been banished. Before too long, Mary realized she never wanted to leave h Reviewed by Lee Ashford for Readers' Favorite. Before too long, Mary realized she never wanted to leave her valley. She felt more freedom living alone, depending on her own garden and the wild edibles growing all around her, than she ever had while living in the city. One day, after more than 16 years of solitude, she saw a man walking down the old road leading to her house. Who was he? What did he want? Mary did not know, but she had a sense of foreboding in the pit of her stomach. Things would soon change in ways she – and you, the reader – could never have imagined. 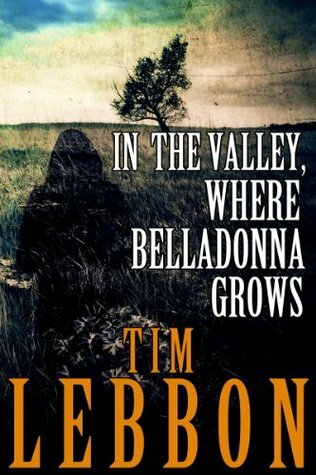 “In the Valley, Where Belladonna Grows” is an exceptional novella, and Tim Lebbon is a very accomplished author. This story is woven with a rich tapestry of descriptive words to carry you into a dream-world peopled only by Mary. The landscape in Mary’s valley is awe-inspiring. Even the Belladonna is reluctant to cross the fence into Mary’s garden, as it spreads its way through the valley. Her garden is so eloquently pictured you can almost smell the compost. “In the Valley, Where Belladonna Grows” is another exceptional story from Tim Lebbon’s fertile imagination. I feel a sense of loss, now that I’ve finished reading this story. I want to go back to Mary’s valley. In a way, I envy you; you still have this experience ahead of you. Mary has lived alone in her valley for over 16 years. She has been there ever since her husband banished her from the city. It was supposed to be a punishment and at first it was, but over time she came to love her valley, her garden and even the wildlife that often visited. Now in her late seventies, Mary cannot imagine wanting any other kind of life. She is happy - content. That is why she is so surprised when she gets a visitor from the city with a message from her husband saying that she is n Mary has lived alone in her valley for over 16 years. She has been there ever since her husband banished her from the city. It was supposed to be a punishment and at first it was, but over time she came to love her valley, her garden and even the wildlife that often visited. Now in her late seventies, Mary cannot imagine wanting any other kind of life. She is happy - content. Reality has come crashing into Mary's world and she is not sure what to do about it. So, she chooses to ignore it and does nothing. "Routine calmed Mary's recent upsets and made placid the upheaval that had struck the valley." Although this book is technically a novella since it is only 78 pages long, it contains a full novel's worth of story. This is my second novella by Tim Lebbon and I'm not disappointed... it's beautifully written, unsettling, and hard to put down. Sadly, I read some reviews before starting where I happened to come across a major spoiler. (Thanks! :() I'm not sure if this may have altered my perception on the story, going into it knowing the ending. Either way, Tim Lebbon certainly has a way with words. It's so easy to become immersed. Mary, Mary, quite contrary... how does your garden grow? Mary is an old woman w This is my second novella by Tim Lebbon and I'm not disappointed... it's beautifully written, unsettling, and hard to put down. Sadly, I read some reviews before starting where I happened to come across a major spoiler. (Thanks! :() I'm not sure if this may have altered my perception on the story, going into it knowing the ending. Either way, Tim Lebbon certainly has a way with words. It's so easy to become immersed. I found the beginning very slow and confusing but then I was also intrigued and the story started to grow on me, it is only a 2-3hour read and you will be rewarded with not only a well thought out tale but well written with some great descriptions of a beautiful way of life. Apparently Mary has been wronged by her powerful husband Sherlock, cheated on and beaten until she decided to shove back. She has been banished to a valley where, even at her late stage in life, she must fend for herself and I found the beginning very slow and confusing but then I was also intrigued and the story started to grow on me, it is only a 2-3hour read and you will be rewarded with not only a well thought out tale but well written with some great descriptions of a beautiful way of life. Apparently Mary has been wronged by her powerful husband Sherlock, cheated on and beaten until she decided to shove back. She has been banished to a valley where, even at her late stage in life, she must fend for herself and live off and with the land. TL unwinds this relationship with Sherlock and its slow demise like a tangled ball of knitting wool. In this ball are some huge knots in the shape of rapid dogs, half dead visitors and some hysterical home renovation skills. I found the ending most satisfying and whilst it took me awhile to get into the story I really enjoyed the meander. I look forward to reading more of Tim Lebbon. When I started this, I didn't realize that it was a bonus story for the book "The God of Rain". I think that, because I've never read that one, my enjoyment of this way have been lessened (but I can't say for sure, obviously). This is an interesting story, but that's about it. I didn't find it very impactful or memorable, which I think is so important for short stories. If you are a fan of "The God of Rain" or Tim Lebbon in general, check this out. If not, don't. I wish I could be more articulat When I started this, I didn't realize that it was a bonus story for the book "The God of Rain". I think that, because I've never read that one, my enjoyment of this way have been lessened (but I can't say for sure, obviously). This is an interesting story, but that's about it. I didn't find it very impactful or memorable, which I think is so important for short stories. If you are a fan of "The God of Rain" or Tim Lebbon in general, check this out. If not, don't. I wish I could be more articulate, but this was one of those stories that is like..."Ok. I read it. Now what?" I won't go so far as to say that it's "meh", as I think some elements were interesting, but all in all, I doubt I'll remember this one in a few weeks. I've read a few books by Mr. Lebbon, and while they're good, his short stories and novellas are the absolute best. This story was so well written that I found myself lost for a few hours. It was a bit like walking through a thick fog on a dark night and almost haunting. The ending was the shock that I was hoping for. I also enjoyed the second short story. Yep, I'd recommend this story and author. If you're looking for something fast paced then this book is probably not for you, but if you like a I've read a few books by Mr. Lebbon, and while they're good, his short stories and novellas are the absolute best. This story was so well written that I found myself lost for a few hours. It was a bit like walking through a thick fog on a dark night and almost haunting. The ending was the shock that I was hoping for. I also enjoyed the second short story. Yep, I'd recommend this story and author. If you're looking for something fast paced then this book is probably not for you, but if you like a good, slow building horror then this one should do it. "Philosophy is a luxury of a balanced populace"
An aging woman, living alone, exiled by her husband, making a life and finding peace in a gorgeous valley when a stranger appears on the horizon. Her first visitor and human contact in 16 years shatters her sense of peace. I loved this novella. Very immersive and beautifully written. A curtain of dread begins to smother you, the reader, as visitors begin to descend into Mary's valley, into her life. A Wonderful read. Check it out. The Mouths of Madness "Philosophy is a luxury of a balanced populace"
Elegant and haunting are the two words that stick in my mind about this book. Not having any idea what was going on at first, Mary living in her valley seemed almost idyllic to me. But as the story progresses, I got the feeling that all was not as it seemed. The symbolism used and the skillful writing make this an amazing read, and is recommended. Tim Lebbon writes beautiful prose that draws you into the story and holds you within. 'In the valley...' is a perfect example of this. I wasn't a massive fan of the ending, which felt a touch rushed and cliche, but I was won over by the beautiful, haunting addition of the short story 'The God of rain' included with this novella. Good read. Tim Lebbon rarely disappoints. Good character building, descriptions that at times could be paiNtings if you close your eyes, bit of creepiness in there. I thought more suspense than horror but very readable. What a remarkable, memorable story this was. Felt like watching a Twilight Zone episode. I was born in London in 1969, lived in Devon until I was eight, and the next twenty years were spent in Newport. My wife Tracey and I then did a Good Thing and moved back to the country, and we now live in the little village of Goytre in Monmouthshire with our kids Ellie and Daniel. And our dog, I love writing, reading, triathlon, real ale, chocolate, good movies, occasional bad movies, and cake.